IRVINE, CA--(Marketwire - April 20, 2010) - Teridian Semiconductor today announced the launch of its new energy measurement system-on-chip (SoC), the 78M6618 (6618), for use in data center power distribution units (PDUs) and applications in the smart home, including intelligent power strips and circuit breaker panels. The new chip is the industry's first and only SoC that enables power metering, monitoring and intelligent relay control of eight single phase outlets simultaneously. In addition, the 6618's unique ability to monitor and control eight channels at once can be extended to 32 or more channels by connecting multiple chips together. The latest addition to Teridian's new energy measurement product family, the 6618 adds a new level of 'intelligence' to PDUs that will enable the reduction of drastic failures and critical downtime by allowing administrators to better understand the power that is being used in the data center. "When even one minute of downtime can equal millions of dollars in losses, quantifying and understanding minimum and maximum energy requirements of servers, power supplies, PDUs, and communication equipment on a per-outlet level is key," said Jay Cormier, Teridian vice president and general manager, Energy Measurement & Communications. "We offer the additional advantage of an extremely clear value proposition over competing solutions as we can monitor eight outlets simultaneously with a single chip. Alternative solutions require eight chips and a microcontroller to achieve the same results." The 6618 offers unprecedented accuracy of better than +/-0.5 percent over a 2000:1 dynamic range with self calibration to facilitate rapid design time and optimal manufacturing efficiencies. The 6618 is a highly integrated, single phase, eight-outlet, PDU power measurement, and monitoring SoC, which includes a 32-bit compute engine, an MPU core and FLASH memory. Teridian's patented Single Converter Technology™, with a 22-bit delta-sigma ADC, 10 analog inputs, precision voltage reference, and digital temperature compensation, supports a wide range of PDU metering applications with very few external components. A complete array of ICE and development tools, programming libraries and reference designs enable rapid development and prototyping of power and energy measurement devices. 78M6618 sample and production quantities are available now and priced at $5.90 in quantities of 1,000 with evaluation boards and application firmware also available now. For more information on the 78M6618 product line and other products from Teridian, please visit www.teridian.com. Teridian Semiconductor designs, manufactures and provides engineering support for its system-on-chip integrated circuits used in the energy measurement, control and communication markets, as well as networking, and secure access systems. Teridian's products are used in smart utility meters, as well as enterprise based solutions such as servers, power distribution units and outlet monitoring devices to measure power dissipation with high accuracy, and enable communication processing of recorded energy data. Teridian has created five generations of products, and is working with manufacturers to enable the global trend toward improving energy efficiency via a smart energy grid network. Additional company and product information can be found at http://www.teridian.com. 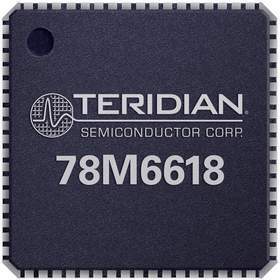 Teridian's 78M6618 is the industry's first and only SoC that enables power metering, monitoring and intelligent relay control of eight single phase outlets simultaneously. Designed for use in PDUs and smart home applications, the 78M6618 adds a new level of intelligence to PDUs to reduce failures and downtime by allowing administrators to better understand the power being used in the data center.